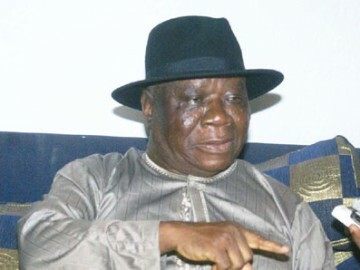 South South Leader, Chief Edwin Clark, yesterday described as most uncharitable comments by former Inspector- General of Police and chairman of the Arewa Consultative Forum (ACF), Ibrahim Coomassie that the removal of Suleiman Abba as Inspector General of Police was suspicious. Clark noted that Coomassie’s statements were ethnically driven and was aimed at inciting the North against President Goodluck Jonathan. “To say the least, this is the most uncharitable comment coming from a former Inspector General of the Nigerian Police who is conscious of the fact that the Police is a discipline establishment. “It is very wrong of Commassie to question President Jonathan’s actions and decisions, as this amount to wanting to usurp his rights as President. The elections are over and we have accepted the outcome, let us create a conducive atmosphere for the new government to take off,” he told journalists at his Asokoro residence, Abuja. The elder statesman noted that the problem with the country was ethnicity and religion. This, he said, must be addressed by the new government to achieve harmony in the country. He noted that Nigerians belong to all citizens of the country, stressing, “we all have equal claim in its affairs. Respect for one another is the key determinants for peace and harmony in this great country of ours”. Four Children Sold At N60,000 Rescued By Lagos Govt.